Caitlin Green: Sasanian finds in early medieval Britain and beyond: another global distribution from Late Antiquity? A previous post mapped and discussed the spread of early Byzantine finds across both Eurasia and Africa, ranging from Britain to Japan and Sweden to Tanzania. The following one expands upon this by turning to look at the global distribution of finds from the fifth- to seventh-century Sasanian Empire, the early Byzantine Empire's eastern neighbour and rival, starting with an examination of Sasanian coins found in Britain. This Late Antique empire, with its capital at Ctesiphon near to modern Baghdad, controlled an extensive area stretching from Iraq in the west to Pakistan in the east, and items produced within this territory are once again found spread across both Eurasia and Africa. Needless to say, the extensive distribution of Late Sasanian material shown here is of interest for a number of reasons from the perspective of this blog, not least the light that it sheds on trade and movement in this era and Britain's place within the wider global community. Distribution of Sasanian finds of the fifth to seventh centuries AD found outside of the boundaries of the late sixth-century Sasanian Empire, along with a depiction of the empire during the late sixth century. For a larger version of this map, click here. Note, the map is based on the sources listed in fn. 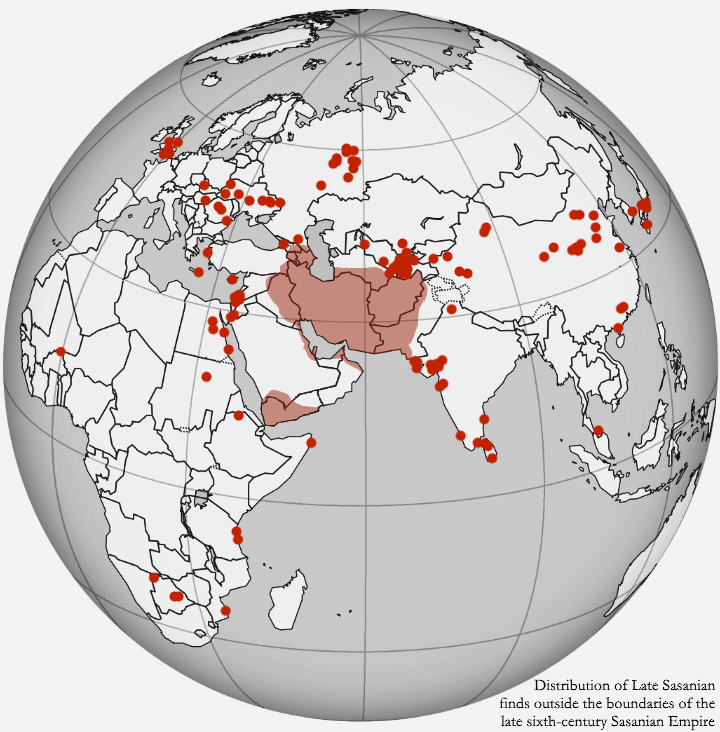 1 and is not exhaustive; rather, it is intended to offer an impression of the wide distribution of fifth- to seventh-century Sasanian objects across Eurasia and Africa. Image: C. R. Green. A Sasanian coin of Khosrow II, 590–628, found on the coast of the Island of Anglesey, Wales, in 2001 (image: PAS, CC BY 2.0, kindly modified by Yngve Karlsson). 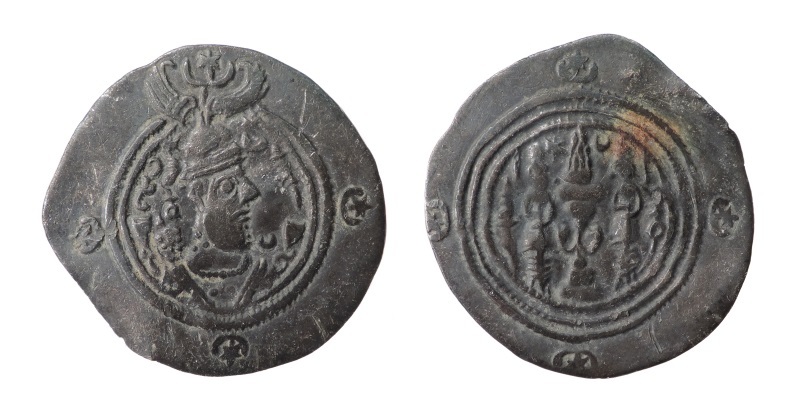 A Sasanian coin of Khosrow II, 590–628, minted at Ram Hormuz in southwestern Iran and found at Thamesfield, London; it was recorded by the PAS in 2017 (image: PAS, CC BY 2.0). 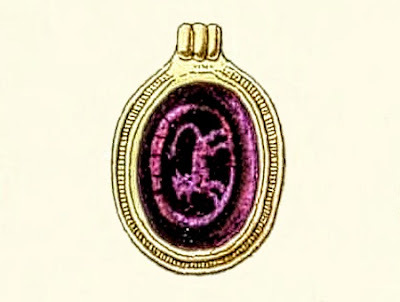 A garnet intaglio of a lion mounted in an seventh-century Anglo-Saxon gold pendant from grave 172, Sibertswold Down, Kent; the gem has most recently been identified by Jeffrey Spier as a Sasanian original in his Late Antique and Early Christian Gems (Wiesbaden, 2007), p. 87. Image: Public Domain, drawn and engraved by F. W. Fairholt for B. Faussett, Inventorium Sepulchrale (London, 1856), plate IV, no. 17. A repaired complete Sasanian glass bowl excavated from the sixth-century AD tumulus of Emperor Ankan in Osaka, Japan (image: Wikimedia Commons). 1. The following sources were used for areas other than Britain when putting together the map included here; it should, incidentally, be noted that Sasanian coins found in association with Islamic coinage—as all finds in Scandinavia, for example, seem to be—are not mapped here as they are believed to represent post-Sasanian trade. Map sources: I. Smirnov (ed. ), Vostochnoe Serebro (St Petersburg, 1909); F. E. Day, 'Silks of the Near East', Bulletin of the Metropolitan Museum of Art, 9.4 (1950), 108–17; J. P. Oleson, 'An unpublished Sassanian seal, with a comment on the deportation of Armenians to Cyprus in AD 578', Levant, 8 (1976), 161–4; J. A. Lerner, 'Sasanian seals in the Department of Medieval and Later Antiquities of the British Museum', Journal of Near Eastern Studies, 35 (1976), 183–7; P. O. Harper & P. Meyers, Silver Vessels of the Sasanian Period. Volume One: Royal Imagery (New York, 1981); H. M. Malek, 'A survey of research on Sasanian numismatics', The Numismatic Chronicle, 153 (1993), 227–69; P. Urbańczyk (ed. ), Origins of Central Europe (Warsaw, 1997); E.A. Smagulov, 'Finds of Sasanian gems in the Otrar Oasis', Ancient Civilizations from Scythia to Siberia, 3.2 (1997), 253–9; J. K. Skaff, 'The Sasanian and Arab-Sasanian silver coins from Turfan: their relationship to international trade and the local economy', Asia Major, 11.2 (1998), 67–115; S. D. Sears & D. T. Ariel, 'Finds of Late Sasanian and Early Muslim drachms in historical Palestine', ‘Atiqot, 40 (2000), 139–50; A. M. Maeir, 'Sassanica Varia Palaestiniensia: a Sassanian seal from T. Iṣtaba, Israel, and other Sassanian objects from the Southern Levant', Iranica Antiqua, 35 (2000), 159–83; M. Compareti, 'The Sasanians in Africa', Transoxiana, 4 (2002), online at http://www.transoxiana.org/0104/sasanians.html; T. Daryaee, 'The Persian Gulf trade in Late Antiquity', Journal of World History, 14 (2003), 1–16; R. K. Kovalev, 'Commerce and caravan routes along the Northern Silk Road (sixth-ninth centuries) – Part I: the western sector', Archivum Eurasiae Medii Aevi, 14 (2005), 55–105; S. Li, 'The distribution and significance of Sassanid silver currency in China', Chinese Archaeology, 6 (2006), 190–4; M-L. Chen, 'The importation of Byzantine and Sasanian glass into China during the fourth to sixth centuries', in A. Harris (ed. ), Incipient Gobalization? Long-Distance Contacts in the Sixth Century (Oxford, 2006), pp. 47–52; R. Tomber, 'Rome and Mesopotamia – importers into India in the first millennium AD', Antiquity, 81 (2007), 972–88; B. Borell, 'The early Byzantine lamp from Pong Tuk', Journal of the Siam Society, 96 (2008), 1–26; S. Magnavita, 'Sahelian crossroads: some aspects on the Iron Age sites of Kissi, Burkina Faso', in S. Magnavita et al (eds. ), Crossroads / Carrefour Sahel: Cultural and Technological Developments in First Millennium BC/AD West Africa (Frankfurt, 2009), pp. 79–104; N. Schindel, Sylloge Nummorum Sasanidarum Israel (Wien, 2009); F. Curta & A. Gândilă, 'Hoards and hoarding patterns in the Early Byzantine Balkans', Dumbarton Oaks Papers, 65–66 (2011–2012), 45–111; T. Power, The Red Sea from Byzantium to the Caliphate: AD 500–1000 (Oxford, 2012); M. Wood et al, 'The glass of Chibuene, Mozambique: new insights into early Indian Ocean trade', The South African Archaeological Bulletin, 67 (2012), 59–74; S .Liu et al, 'Silk Road glass in Xinjiang, China: chemical compositional analysis and interpretation using a high-resolution portable XRF spectrometer', Journal of Archaeological Science, 39 (2012), 2128–42; G. I. Bijovsky, Gold Coin and Small Change: Monetary Circulation in Fifth-Seventh Century Byzantine Palestine (Trieste, 2012); J. Spier, Byzantium and the West: Jewelry in the First Millennium (London, 2012); L. Baratova & N. Schindel, Sylloge Nummorum Sasanidarum Usbekistan (Wien, 2012); A. Giumlía-Mair, 'Metallurgy and technology of the Hunnic gold hoard from Nagyszéksós', The Silk Road, 11 (2013), 12–35; E. Petac & A. Ionescu, 'Some Sassanian silver coins discovered at Axiopolis (Cernavoda, Constanta County, Romania)', Iranica Antiqua, 48 (2013), 355–60; S. Lee & D. P. Leidy, Silla: Korea's Golden Kingdom (New York, 2013); M. Kazanski, 'The Middle Dnieper area in the seventh century: an archaeological survey', in C. Zuckerman (ed. ), Constructing the Seventh Century (Paris, 2013), pp. 769–864; N. Boivin et al, 'East Africa and Madagascar in the Indian Ocean world', Journal of World Prehistory, 26 (2013), 213–81; T. Gesztelyi, 'Sasanian seals in Hungarian collections', Acta Classica Universitatis Scientiarum Debreceniensis, 50 (2014), 179–83; J. Denbow et al, 'The glass beads of Kaitshaa: new insights on early Indian Ocean trade into the far interior of southern Africa', Antiquity, 89 (2015), 1–17; M. Wood, 'Divergent patterns in Indian Ocean trade to East Africa and southern Africa between the 7th and 17th centuries CE: the glass bead evidence', Afriques, 6 (2015), online at http://afriques.revues.org/1782; J. Then-Obluska, 'Cross-cultural bead encounters at the Red Sea port site of Berenike, Egypt. Preliminary assessment (seasons 2009 - 2012)', Polish Archaeology in the Mediterranean, 24 (2015), 735–77 at p. 764; M. Gasparini, 'Sino-Iranian textile patterns in Trans-Himalayan areas', The Silk Road, 14 (2016), 84–96. The depiction of the Sasanian Empire in the late sixth century is based on P. Sluglett & A. Currie, Atlas of Islamic History (Routledge: London, 2014), pp. 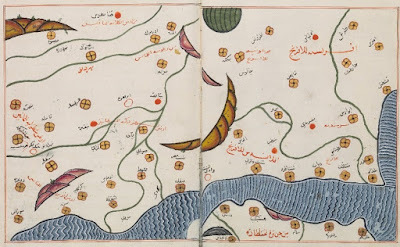 13–15, maps 1 and 2. 2. R. Abdy & G. Williams, 'A catalogue of hoards and single finds from the British Isles c. AD 410–675', in B. J. Cook & G. Williams (eds. ), Coinage and History in the North Sea World, c. AD 500–1250: Essays in Honour of Marion Archibald (Leiden, 2006), pp. 11–74 at p. 57. 3. Portable Antiquities Scheme, LVPL2174; R. Abdy & G. Williams, 'A catalogue of hoards and single finds from the British Isles c. AD 410–675', in B. J. Cook & G. Williams (eds. ), Coinage and History in the North Sea World, c. AD 500–1250: Essays in Honour of Marion Archibald (Leiden, 2006), pp. 11–74 at p. 57. Information on the mint site kindly provided by Yngve Karlsson. 4. M. P. T. Didsbury, Aspects of Late Iron Age and Romano-British Settlement in the Lower Hull Valley (University of Durham PhD thesis, 1990), vol. 2, p. 15 (dated broadly fifth to seventh century); Humber Historic Environment Record, 8734 (dated to the seventh century). 5. Warwickshire Historic Environment Record, MWA9909. 6. Portable Antiquities Scheme, LON-B2F5CF. 7. Portable Antiquities Scheme, LEIC-BF6164. Note, this coin was discovered for purchase at a car boot sale in the Leicester area and no firm details are known of its find circumstances; as such, it needs to be used only very cautiously. 8. Quotation from M. Biddle, 'Ptolemaic coins from Winchester', Antiquity, 49 (1975), 213–15. 9. See, for example, S. Moorhead, 'Early Byzantine copper coins found in Britain – a review in light of new finds recorded with the Portable Antiquities Scheme', in O. Tekin (ed. ), Ancient History, Numismatics and Epigraphy in the Mediterranean World (Istanbul, 2009), pp. 263–74; C. Morrisson, 'Byzantine coins in early medieval Britain: a Byzantinist's assessment', in R. Naismith et al (ed. 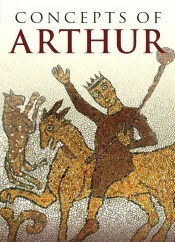 ), Early Medieval Monetary History: Studies in Memory of Mark Blackburn (London, 2014), pp. 207–42; E. S. Georganteli, 'Byzantine coins', in M. Biddle (ed. ), The Winchester Mint and Coins and Related Finds from the Excavations of 1961-71, Winchester Studies 8 (Oxford, 2012), pp. 669–78; G. Williams, 'Anglo-Saxon gold coinage, part 1: the transition from Roman to Anglo-Saxon coinage', British Numismatic Journal, 80 (2010), 51–75; C. Scull et al, 'Social and economic complexity in early medieval England: a central place complex of the East Anglian kingdom at Rendlesham, Suffolk', Antiquity, 90 (2016), 1594-1612. 10. J. Spier, 'Late Antique and Early Christian gems: some unpublished examples', in C. Entwistle & N. Adams (eds. ), ‘Gems of Heaven’: Recent Research on Engraved Gemstones in Late Antiquity, c. AD 200–600 (London, 2011), pp. 193–207 at p. 199 ('A small number of... engraved Sasanian gems, have been found in other Anglo-Saxon graves, a notable indication of the great distance such prized objects could travel. '); J. Spier, Late Antique and Early Christian Gems (Wiesbaden, 2007), p. 87 (identifies the gems from Sibertswold, Kent, grave 172, and Alfriston, Sussex, grave 28, as Sasanian originals). See also P. W. Rogers, Costume in the Early Anglo-Saxon Cemetery at Saltwood, Kent: Part 1, Women's Costume Accessories (2014), finds report, available online here, p. 30; H. Geake, The Use of Grave-Goods in Conversion-Period England, c.600–c.850 (Oxford, 1997), p. 39. 11. G. Williams, 'Anglo-Saxon gold coinage, part 1: the transition from Roman to Anglo-Saxon coinage', British Numismatic Journal, 80 (2010), 51–75 at p. 58. An alternative scenario might be to associate them with the Viking impact on Britain in the ninth century, as Sasanian coins are found alongside later Arab-Sasanian coins and Islamic dirhams in Viking-era hoards in Scandinavia (see, for example, R. K. Kovalev, 'When and what regions of the Islamic world exported Sasanian and Arab-Sasanian silver coins to early Viking-Age Northern Lands? ', in T. Talvio & M. Wijk (eds. ), Myntstudier (Stockholm, 2015), pp. 68–83); however, Gareth Williams does not do this and it is important to note that the distribution of Sasanian coins from Britain catalogued here does not match well with that of Islamic dirhams in Britain thought to have been imported during the Viking-era, as mapped in C. R. Green, 'The distribution of Islamic dirhams in Anglo-Saxon England', 16 December 2014, blog post, online at http://www.caitlingreen.org/2014/12/distribution-of-islamic-dirhams-in-england.html., nor do any of the known Viking-era hoards of dirhams found in Britain contain Sasanian coins. As such, it is not adopted or pursued in the present post. 12. On the coins, see the references cited in fn. 9; references for the imported Byzantine pottery can be found in fn. 13, below. The isotopic results are discussed and summarized in C. R. Green, 'Some oxygen isotope evidence for long-distance migration to Britain from North Africa & southern Iberia, c.1100 BC–AD 800', 24 October 2015, blog post, online at http://www.caitlingreen.org/2015/10/oxygen-isotope-evidence.html and C. R. Green, 'A note on the evidence for African migrants in Britain from the Bronze Age to the medieval period', 23 May 2016, blog post, online at http://www.caitlingreen.org/2016/05/a-note-on-evidence-for-african-migrants.html. The results discussed and analysed in these posts were published in K. A. Hemer et al, 'Evidence of early medieval trade and migration between Wales and the Mediterranean Sea region', Journal of Archaeological Science, 40 (2013), 2352–59; S. Lucy et al, 'The burial of a princess? 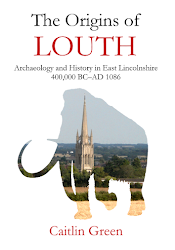 The later seventh-­century cemetery at Westﬁeld Farm, Ely', Antiquity, 89 (2009), 81–141; S. E. Groves et al, 'Mobility histories of 7th–9th century AD people buried at early medieval Bamburgh, Northumberland, England', American Journal of Physical Anthropology, 151 (2013), 462–76; and J. A. Evans et al, 'A summary of strontium and oxygen isotope variation in archaeological human tooth enamel excavated from Britain', Journal of Analytical Atomic Spectrometry, 27 (2012), 754–64 and 'Supplementary Material I' (14 pp.). The textual evidence relates to the early eighth-century Historia Ecclesiastica IV.1, where Bede describes Hadrian, the later seventh- and eighth-century Abbot of St Augustine's, Canterbury, as 'a man of African race' (HE IV.1). Hadrian is thought to have grown up in Libya Cyrenaica before the mid-seventh-century Arab conquest of North Africa: B Bischoff & M. Lapidge, Biblical Commentaries from the Canterbury School of Theodore and Hadrian (Cambridge, 1994), especially p. 92. 13. For eastern Britain and East Anglia, see C. Scull et al, 'Social and economic complexity in early medieval England: a central place complex of the East Anglian kingdom at Rendlesham, Suffolk', Antiquity, 90 (2016), 1594-1612; for western Britain and Byzantine imported pottery, see for example M. Fulford, 'Byzantium and Britain: a Mediterranean perspective on post-Roman Mediterranean imports in western Britain and Ireland', Medieval Archaeology, 33 (1989), 1–6; E. Campbell, Continental and Mediterranean Imports to Atlantic Britain and Ireland, AD 400–800, Council for British Archaeology Research Report 157 (York, 2007); E. Campbell & C. Bowles, 'Byzantine trade to the edge of the world: Mediterranean pottery imports to Atlantic Britain in the 6th century', in M. M. Mango (ed. ), Byzantine Trade, 4th-12th Centuries: The Archaeology of Local, Regional and International Exchange (Farnham, 2009), pp. 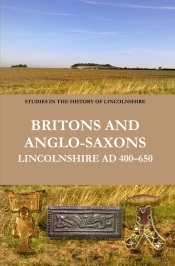 297–314; and T. M. Charles-Edwards, Wales and the Britons, 350–1064 (Oxford, 2013), pp. 222–3. On Byzantine–British connections, we can also note, for example, the Penmachno Stone from North Wales, which has recently been persuasively interpreted as a late sixth-century monument declaring continuing British loyalty to the Byzantine Emperor Justin II: T. M. Charles-Edwards, Wales and the Britons, 350–1064 (Oxford, 2013), pp. 234–8. 14. For example, Procopius in the mid-sixth century mentioned that the Romans of the eastern empire (now usually termed the Byzantine Empire) 'buy silk from the Persians', although few potential examples now survive of these silk imports: see H. B. Feltham, 'Justinian and the international silk trade', Sino-Platonic Papers, 194 (2009), pp. 1–40; M. Compareti, 'The Sasanians in Africa', Transoxiana, 4 (2002), online at http://www.transoxiana.org/0104/sasanians.html; F. E. Day, 'Silks of the Near East', Bulletin of the Metropolitan Museum of Art, 9.4 (1950), 108–17; N. Oikonomides, 'Silk trade and production in Byzantium from the sixth to the ninth century: the seals of kommerkiarioi', Dumbarton Oaks Papers, 40 (1986), 35–53. On gems, coins and other Sasanian artefacts in the Byzantine Empire, see for example J. P. Oleson, 'An unpublished Sassanian seal, with a comment on the deportation of Armenians to Cyprus in AD 578', Levant, 8 (1976), 161–4; J. A. Lerner, 'Sasanian seals in the Department of Medieval and Later Antiquities of the British Museum', Journal of Near Eastern Studies, 35 (1976), 183–7; S. D. Sears & D. T. Ariel, 'Finds of Late Sasanian and Early Muslim drachms in historical Palestine', ‘Atiqot, 40 (2000), 139–50; A. M. Maeir, 'Sassanica Varia Palaestiniensia: a Sassanian seal from T. Iṣtaba, Israel, and other Sassanian objects from the Southern Levant', Iranica Antiqua, 35 (2000), 159–83; N. Schindel, Sylloge Nummorum Sasanidarum Israel (Wien, 2009). 15. 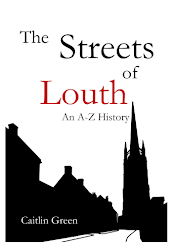 Leontius, Life of St John the Almsgiver, chapter 10; C. A. Snyder, An Age of Tyrants: Britain and the Britons, AD 400–600 (Stroud, 1998), p. 152; C. J. Salter, 'Early tin extraction in the south-west of England: a resource for Mediterranean metalworkers of late antiquity', in M. M. Mango (ed. ), Byzantine Trade, 4th–12th Centuries: The Archaeology of Local, Regional and International Exchange (Farnham, 2009), pp. 315–22 at p. 320; M. M. Mango, 'Tracking Byzantine silver and copper metalware, 4th–12th centuries', in Mango (ed. ), Byzantine Trade, 4th–12th Centuries, pp. 221–36 at p. 223. 16. On Late Antique trade down the East African coast, see especially N. Boivin et al, 'East Africa and Madagascar in the Indian Ocean world', Journal of World Prehistory, 26 (2013), 213–81 at pp. 244–5, for a good, recent summary. On Chibuene and Persian beads traded into Botswana, see M. Wood et al, 'The glass of Chibuene, Mozambique: new insights into early Indian Ocean trade', The South African Archaeological Bulletin, 67 (2012), 59–74; M. Wood, Interconnections: Glass beads and Trade in Southern and Eastern Africa and the Indian Ocean – 7th to 16th centuries AD (Uppsala, 2011); M. Wood, 'Eastern Africa and the Indian Ocean world in the first millennium CE: the glass bead evidence', in G. Campbell (ed. ), Early Exchange between Africa and the Wider Indian Ocean World (Cham, 2016), pp. 173–94 at pp. 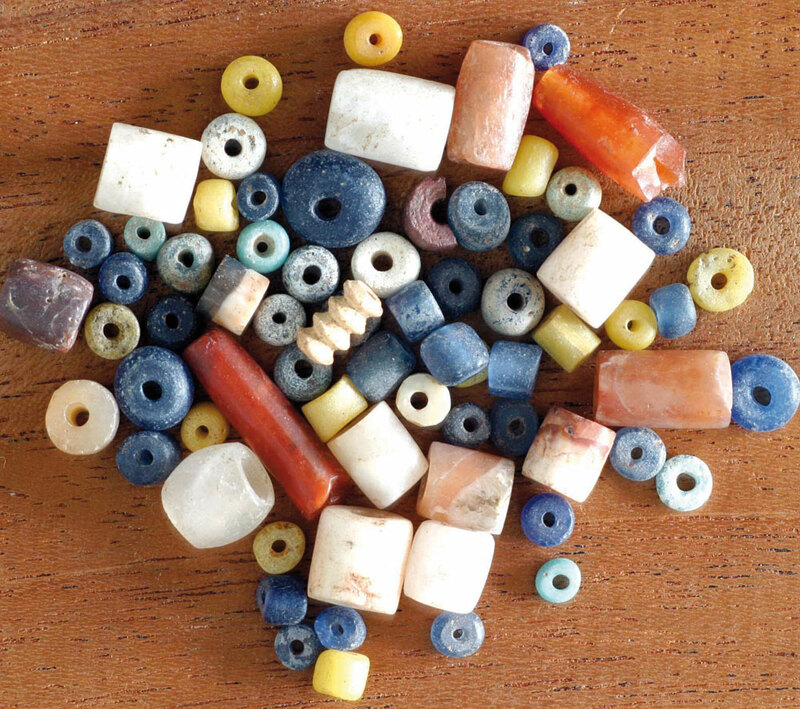 184–6; J. Denbow et al, 'The glass beads of Kaitshaa: new insights on early Indian Ocean trade into the far interior of southern Africa', Antiquity, 89 (2015), 1–17; M. Wood, 'Divergent patterns in Indian Ocean trade to East Africa and southern Africa between the 7th and 17th centuries CE: the glass bead evidence', Afriques, 6 (2015), online at http://afriques.revues.org/1782; A. M. Daggett, Early Iron Age Social and Economic Organization in Sowa Pan, Botswana (Michigan State University PhD Thesis, 2015), especially p. 322. 17. On the Sasanian beads of Sub-Saharan West Africa, see S. Magnavita, 'Sahelian crossroads: some aspects on the Iron Age sites of Kissi, Burkina Faso', in S. Magnavita et al (eds. ), Crossroads / Carrefour Sahel: Cultural and Technological Developments in First Millennium BC/AD West Africa (Frankfurt, 2009), pp. 79–104, and S. Magnavita, 'Initial encounters: seeking traces of ancient trade connections between West Africa and the wider world', Afriques, 4 (2013), online at https://afriques.revues.org/1145. 18. See, for example, S. Li, 'The distribution and significance of Sassanid silver currency in China', Chinese Archaeology, 6 (2006), 190–4; M-L. Chen, 'The importation of Byzantine and Sasanian glass into China during the fourth to sixth centuries', in A. Harris (ed. ), Incipient Gobalization? Long-Distance Contacts in the Sixth Century (Oxford, 2006), pp. 47–52; S .Liu et al, 'Silk Road glass in Xinjiang, China: chemical compositional analysis and interpretation using a high-resolution portable XRF spectrometer', Journal of Archaeological Science, 39 (2012), 2128–42; J. K. Skaff, 'The Sasanian and Arab-Sasanian silver coins from Turfan: their relationship to international trade and the local economy', Asia Major, 11.2 (1998), 67–115. 19. For finds in southern China, see for example Li, 'The distribution and significance of Sassanid silver currency in China'; R. C. Houston, 'A note on two coin hoards reported in Kao Ku', Museum Notes (American Numismatic Society), 20 (1975), 153–60; T. Daryaee, 'The Persian Gulf trade in Late Antiquity', Journal of World History, 14 (2003), 1–16; T. Daryaee, Sasanian Persia: The Rise and Fall of an Empire (London, 2009), pp. 138–9. Note, Daryaee, 'The Persian Gulf trade in Late Antiquity', p. 13, suggests the coastal finds in east China may also result from the maritime trade route, rather than the overland Silk Road, and notes the discovery of a potential Zoroastrian fire-temple in southern China (p. 14). For finds in India, Sri Lanka, and Thailand (at Yarang) and documentary references to Persian maritime trade across to China, see, for example, R. Tomber, 'Rome and Mesopotamia – importers into India in the first millennium AD', Antiquity, 81 (2007), 972–88; B. Borell, 'The early Byzantine lamp from Pong Tuk', Journal of the Siam Society, 96 (2008), 1–26 at pp. 9 and 11; D. Whitehouse & A. Williamson, 'Sasanian maritime trade', Iran, 11 (1973), 29–49; Daryaee, 'The Persian Gulf trade in Late Antiquity'; and S. Faller, 'The world according to Cosmas Indicopleustes – concepts and illustrations of an Alexandrian merchant and monk', Transcultural Studies, 1 (2011), online at http://heiup.uni-heidelberg.de/journals/index.php/transcultural/article/view/6127/2962, although see now R. R. Darley, '"Implicit cosmopolitanism" and the commercial role of ancient Lanka', in Z. Biedermann & A. Strathern (eds. ), Sri Lanka at the Crossroads of History (London, 2017), pp. 44-65, on the disputed character of Sri Lankan finds of Sasanian coins and also on textual references to Persian activity on the island. 20. On the Korean finds, see C. Kwangshik, 'Silla art and the Silk Road', International Journal of Korean History, 19 (2014), 1–22 at p. 3; S. Lee & D. P. Leidy, Silla: Korea's Golden Kingdom (New York, 2013), p. 125. On the Japanese finds, see S. Priestman, 'The Silk Road or the sea? Sasanian and Islamic exports to Japan', Journal of Islamic Archaeology, 3 (2016), 1-35, who argues for these items having arrived via the sea rather than the overland Silk Road; there is also some discussion of these finds in the Encyclopædia Iranica, 'Japan XI: collections of Persian art in Japan' (2008), available online. The documentary evidence for a Persian official living in Japan was revealed in October 2016: 'Research uncovers evidence that ancient Japan was "more cosmopolitan" than previously thought', Japan Times, October 5 2016, online edition.